In a deep container, mix the pumpkin purée with the eggs. Little by little, add the baking powder, flour, salt, Parmesan cheese and pepper. Heat the oil in a frying pan. Use a spoon to portion out the pumpkin mix. Drop the portioned dough into the hot oil and cook until fritters are golden brown on each side. Arrange the fritters on a paper-towel lined plate and sprinkle with the chopped parsley. Serve on a plate or tray with a side of mayonnaise or sour cream for dipping. Add even more flavor by tossing chopped veggies in the batter before frying. We’re in pumpkin season and there are countless recipes I’ve found to easily incorporate the bounty of this harvest. One way to enjoy and make the most of fresh pumpkin is preparing these delicious fritters that are as flavorful as they are easy to make. To shave even more time off the overall prep, use canned pumpkin in place of making your own traditional purée. My secret for this recipe? Go heavy on the cheese! Besides adding exquisite flavor, it also gives these fritters better consistency. 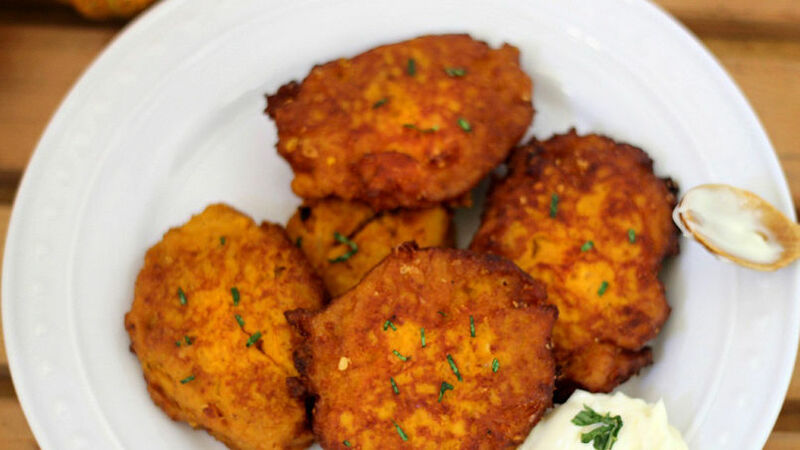 Serve these pumpkin fritters as a side to any main dish.